The discrete adjoint of a reconstruction-based unstructured finite volume formulation for the Euler equations is derived and implemented. The matrix-vector products required to solve the adjoint equations are computed on-the-fly by means of an efficient two-pass assembly. The adjoint equations are solved with the same solution scheme adopted for the flow equations. The scheme is modified to efficiently account for the simultaneous solution of several adjoint equations. The implementation is demonstrated on wing and wing–body configurations. 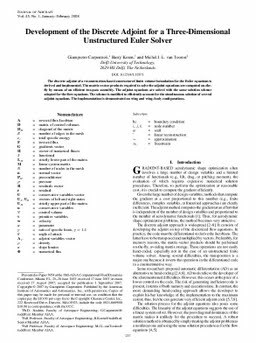 Carpentieri, G, Koren, B, & van Tooren, M.J.L. (2008). Development of the Discrete Adjoint for a Three-Dimensional Unstructured Euler Solver. Journal of Aircraft, 45(1), 237–245.